Awesome, thank you! I'll add them to the OP, I'm sure they'll help everyone. Looks like they're the same sheet, so you only need one link. If you have a n3ds or n2ds there is an option to use your system as a device in the local network that windows7 and onwards can access. That's nice, should be easier than unscrewing the back every time. I'll have to try this out and see how many random Animal Crossing and Tomodachi Life screenshots are hidden away on my 3DS. I'm interested in general impressions of this game. Is it so good that I should play it before playing games like Untold 2 or V? Deciding on a party is hard. I think I've switched my long range attacker between gunner and zodiac four times now. I think now I'm finally, firmly in the gunner camp though. Now that I've reached level 40 and gunner has elemental attacks, it's closing one of the major gaps it has with zodiac. Also I think it's just a more fun class to play -- I like the risk / reward between deciding whether to go for fast or slow attacks, and whether to charge or not. I got IV a few years back and played about 30 hours of it or so. I'm not sure I'd like to return to it and finish it, I'm more interested in starting a new game altogether. in that case, whichever is cheapest. V and U2(classic mode) are great. I think the quality is fairly consistent across EO games. The major advantage this one has over others is a ton of extra portraits to choose from, and a lot of classes. If that's exciting to you (I know it is for me), then maybe you could go directly to Nexus. Otherwise I don't think it matters too much. EOV and Untold 2 both have demos with progress transfer, I think (Nexus doesn't unfortunately). You could start them both up and see which appeals to you more. Looks like Nexus is already sold out on Best Buy. I wonder if it'll be restocked with the Launch Edition or not. I've got Nexus coming in the mail anyway, I'll just play that. Yeah, you can't go wrong with any EO tbh. I am itching to jump on Nexus (party already planned) but I started IV for the first time some weeks ago and now must choose finish that or juggle them. When do subclasses unlock? I’m in the fifth labyrinth, is it tied to level or story progress? Around halfway through the game, you'll probably be lv45-50. 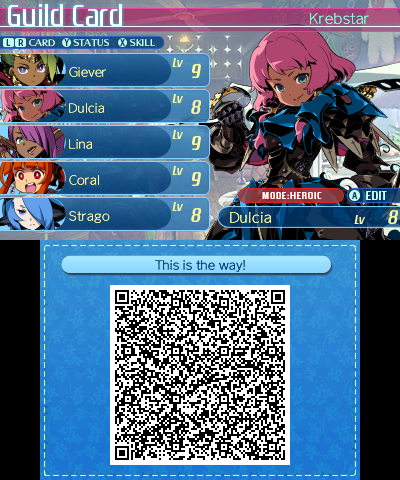 Here's my guild card if anyone wants. You need to come back the next day and they'll let you through the door. Could someone explain MATK and MDEF - are these for elemental damage or any skills? 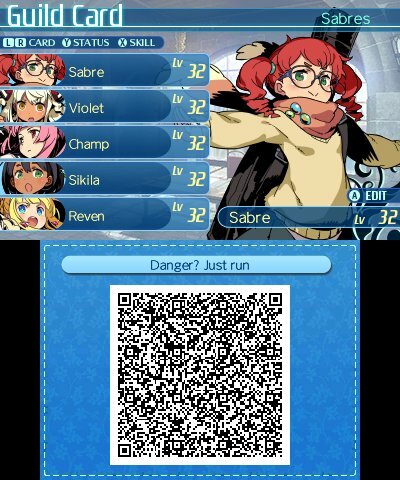 If I have a character that only has physical attacks/skills is it worth worrying about their MATK? Hero is a fantastic class. Like it much more than the new classes from U1/U2. Basically any skills that run off INT for calculations use MATK for the damage value and hits MDEF. So other than Zodiac, Sovereign's Element Bombs and Arcanist's Dismiss Blows use MATK. The elemental attacks from Gunner and Imperial uses ATK since it runs off STR. I don't understand the Force Boost of War Magus. What is the War Edge bonus? It feels like I’ve got most bases covered with that setup so I think you’ll be fine, to be honest Hero, Protector and Sovereign make such a strong party on their own that anything you add in terms of binds, debuffs, spells etc will just continue to round it out. I went for survivalist as the map skills to negate floor tile effects and reduce encounter rate make things a bit less frustrating for me in terms of moving around, plus the gathering skills means spending less points in it elsewhere. War magus has all those attacks that do an extra thing if the target has an ailment. I believe putting them in boost removes that restriction so that those skills are all full power even if the target doesn't have any ailments on them yet. So good for if you really need to land something like a strength slash right now and the target isn't poisoned or blind or anything. so totally useless unless you put some points into that branch of the War Magus skills. I wanted my war magus to make it full healer with the War Heal spells and Vampire passive. I don't want to take things too far off-topic, but Microsoft disabled disabled SMBv1 support on Windows 10 as it is ancient, and a security risk now (not only for 10, but it sounds like 7/8.1 were not updated?) Unfortunately, that's what the 3DS uses. It can be re-enabled, though I don't recommend it. At least disable it again once you're finished transferring files if you do enable it. What I recommend is running a separate virtual machine which has SMBv1 enabled, and connect to the 3DS via that. That way it is only the virtual machine which is at risk, rather than your main OS. Even if your war magus is focused on heals and in the back row and doesn't care about its damage and has no ailment support in the slightest, just get points into guard/strength slash and then against bosses you boost, throw out a guard slash, and now your party is doing 30% (if maxed) more damage across the board for 7 turns. Who cares if you're using it from the back row with a no damage weapon? The debuff is what matters. strength slash/guard slash are maybe the best debuffs in the entire game. It would be a mistake not to make use of them against bosses. Even at only a single sp point, guard slash gives your party a 15% damage increase for 7 turns. Which is insanely good. God something about drawing the maps in these games is so gratifying. I guess I'll have to dust off my 3DS and plug it in to charge! So given that this brings back both subclassing and the Ninja class, is it possible to replicate the self-resurrecting Ninja/Monk suicide clone squad from III? Managed to beat the 5th Labyrinth. The boss fight was cool but my group managed to handle it quite well. There was only one scary part in the middle when someone died and I couldn't really rezz him for 2 turns due to him instantly dieing again. My party is currently level 37 (36 after the boss, 37 after the quest). Next up is the third sub dungeon before I go into the next major Labyrinth. I’m not too far behind you, just trying to sort out the hair clip quest on B4 before tackling the boss. Starting to think about subclasses. Highlander looks good for Hero for the stat boosts. The backline are looking for revive abilities and increased TP. Protector is the one I’m stuck on, anyone got any ideas? I just wanna say, that girl was the worst Protector ever. I got my copy! I feel bad because I haven't played (or gotten...) V yet, but whatever. 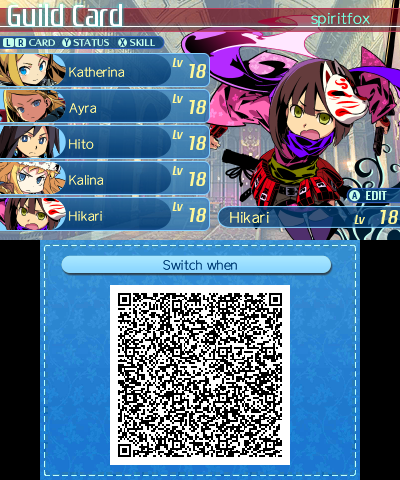 It feels nice to know I'm playing a Etrian upon the first week of release.